1. Up to four GV-SDI-204 Cards can be connected. 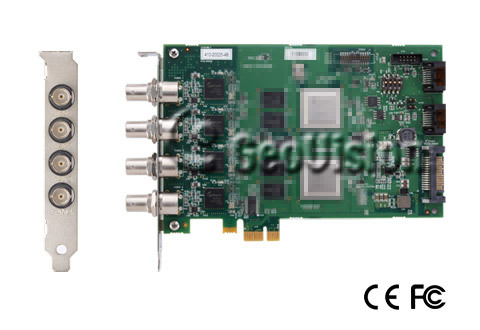 GV-SDI-204 Cards can also be installed with other types of GV-Video Capture Cards including GV-900A, GV-800B, GV-650B, GV-600B, GV-1480A / 1240A / 1120A Combo Cards, GV-1480B / 1240B / 1120B Combo Cards, GV-4008 and GV-5016, but the total number of channels cannot exceed 32 channels. 2. GV-SDI-204 is currently not compatible with VIA series and ATI series chipset motherboards. 3. GV-SDI-204 does not support the TV-Out function. 4. To work together with GV-SDI-204, GV-NET/IO Card V3.1 must be set in the I/O Box Mode and connected to the PC through USB or DB9. 5. Specifications are subject to change without notice.